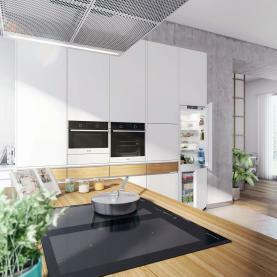 From ordinary gas to state of art induction hobs with sensors which will make the cooking process a pleasure both for beginning and experienced kitchen chefs! The design of these kitchen appliances can also be very minimalistic or modern supplemented with elegant details (edge design aesthetic, control panel, handles, etc.). 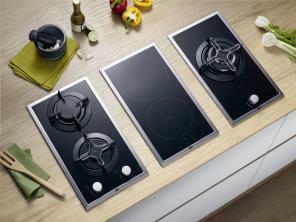 The best combinations meeting different cunsomer needs can be combined from hobs with two heating areas ("Domino"). Gas overflow safety: if the flame is accidently extinguished by wind or by overflowing liquid, the flame failure device automatically cuts off the gas supply to prevent any gas leakage. Cast iron supports: provides maximum stability and stylish appearance. WOK burner: enhanced power burner which heats pan quicker and allows to cook food only in several minutes. Safety features: residual heat indicators which indicate that the surface of an individual cooking zone is not cool enough to touch, electronic child lock, the overflow liquid sensitive control unit, automatic shut off. Flexibility: versatile cooking zones that offer the flexibility between single, double, triple or extended operation levels according to the size of your pot. Weather the consumer uses a small or a big pot, he is only using the amount of heat he needs. Easy cleaning: smooth and scratch resistant surface. Uniqueness and safety: induction hobs heat up only the surface under the cooking utensil. If there is no contact with the pot or if the pot is left on the cooker for an unusually long period of time, the heating stops automatically. The small safety features ensure that the hob will not be activated by an any other extraneous object such as tea spoon that might have been accidentally been dropped on the hob. Booster function: induction hob efficiency increases because it is supplied by additional power. Silent operation: because of smart induction reels switching and use of advanced components, operation of induction hobs becomes very quiet. 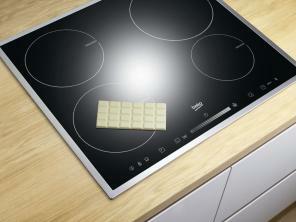 Timer: it is possible to set optionally a period of time, after which is over the hob is turned off automatically.